A great shot. Perfect tone. Congratulations ! One of the most stunning views I have seen from the slopes of Mt. Everest. A breathtaking and stunning picture, absolutely fantastic! One of the most beautiful pictures I\'ve ever seen. You really captured a lot of emotion here. I feel really honored to see view this breath-taking sight! I\'ve just discovered your photoblog, you have some amazing photos here, really beautiful & inspiring, with great commentary. I really like this image, the way the cloud seems to separate the serenity of these beautiful peaks from everything that goes on in the world below. Look forward to seeing a lot more. Wow this photo is absolutely amazing! Certainly the best photo I\'ve seen in a photoblog in well over a month! Stunning! wooww.. words cant describe this pic.. nepal is so beautiful but no one sees it.. amazing..
What everyone else here said, this is an amazing image…. hard to stop looking at it. Just awesome…breathtaking…no other words to explain. 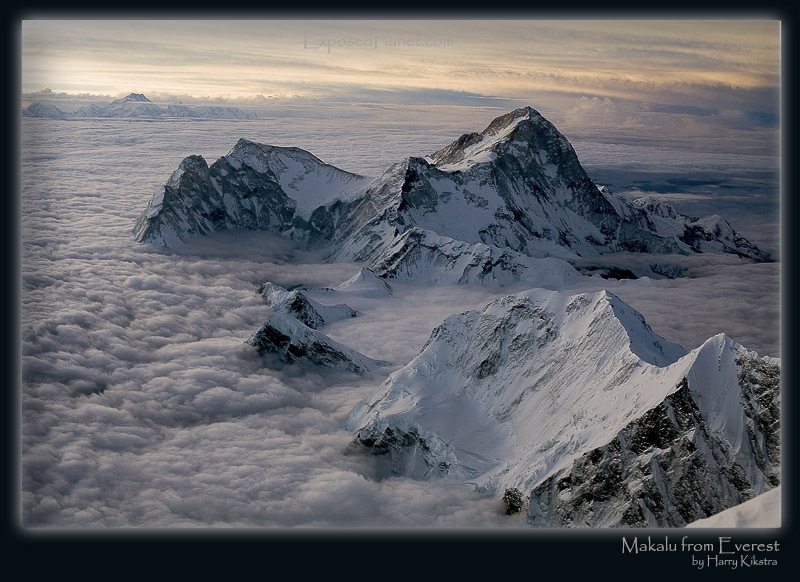 The story behind "Makalu from the third step on Everest"
Makalu is the 5th highest mountain on earth. Looking down on it means you are higher, in this case about the 3rd ‘Step’ on Everest. Seeing the sunrise chasing away the nightly cold over the cloud sea is incredible and makes you feel more alive than ever, even when being in the center of the ‘Death Zone’..
Makalu is the 5th highest mountain on earth. Looking down on it means you are higher, in this case about the 3rd 'Step' on Everest. Seeing the sunrise chasing away the nightly cold over the cloud sea is incredible and makes you feel more alive than ever, even when being in the center of the 'Death Zone'..